Duck & Goose fans of every age will want to honk, quack, dance and sing along with the New York Times bestselling pair in this fun board book, which includes a link to an original Duck & Goose song! Honk, quack, dance, and sing with New York Times bestselling friends Duck & Goose in this fun new board book, which includes a link to an original Duck & Goose song. Want to learn the Duck & Goose song and dance? Join Duck & Goose at their dance party! With easy-to-follow moves, like first jump forward and then jump back, Duck & Goose, Let's Dance! is sure to get little bodies wiggling. 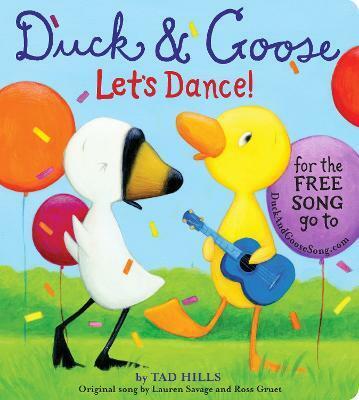 This lively board book features lyrics from an original song by Lauren Savage and Ross Gruet, so put on your dancing shoes and get ready to "walk like a duck, honk like a goose, and flap your fuzzy tail feathers, too." Here's the perfect addition to any Duck & Goose library, which includes Duck & Goose Go to the Beach; Duck & Goose Colors! ; Duck & Goose Find a Pumpkin; Duck & Goose, It's Time for Christmas! ; and more! To download the Duck & Goose song, visit duckandgoosesong.com. Tad Hills is the author and illustrator of the highly acclaimed New York Times bestselling picture books Duck & Goose; Duck, Duck, Goose; Duck & Goose Go to the Beach; How Rocket Learned to Read; and Rocket Writes a Story. He has created numerous Duck & Goose board books, among them the ALA-ALSC Notable Children's Book What's Up, Duck? ; Duck & Goose, It's Time for Christmas! ; and Duck & Goose Colors! The Rocket series includes a board book, Rocket's Mighty Words, and two leveled readers, Drop It, Rocket! and Rocket's 100th Day of School. Tad lives in Brooklyn with his wife, their two children, and a dog named Rocket. Visit the author online at tadhills.com. Lauren Savage and Ross Gruet are siblings who grew up in Longmeadow, Massachusetts, and now write music together from opposite ends of the country. Lauren is the owner and creator of The Reading Bug, a children's bookstore in San Carlos, California. She graduated from Emerson College in Boston with a BFA in musical theater and has performed in many Off-Broadway and regional musicals, as well as in some film and TV productions. She lives outside San Francisco with her husband and two young daughters, who love to dance and sing. Ross is a multi-instrumentalist and graduate of Berklee College of Music with a degree in Music Business and Management. He has toured and recorded in a variety of major- and indie-label bands, playing guitar and piano and singing. He is a project manager for Yep Roc Records and lives in Durham, North Carolina, with his wife.